Defendant failed to maintain a proper stairway. The stairs may have been improperly constructed with steps and risers that don’t comply with code and this often causes trips. The stairs may not have been supplied with railings or banisters which deprive the injured person of the ability to break his fall. 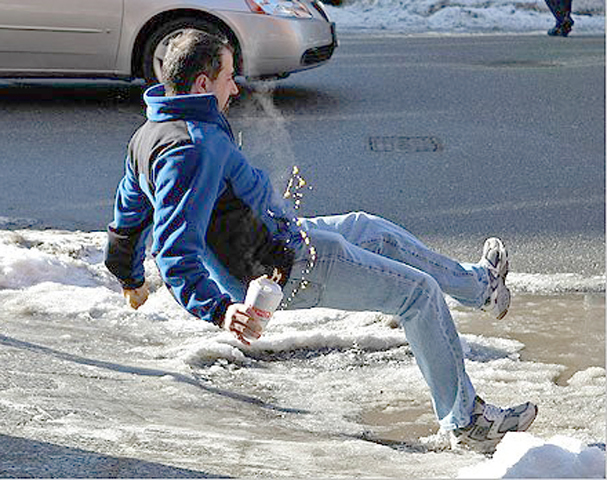 The other most common cause of a slip and fall is the failure of the defendant to maintain a proper walking surface. This could be a substance or barrier which caused a slip or a trip. It could be the failure to repair the surface after cracks or depressions occurred and were not repaired promptly. Very often slip and falls are attributable to ice and snow. In an ice and snow case the plaintiff must demonstrate that the spot at which he fell was covered with ice and/or snow which was not properly cleared within a reasonable time after the snow fell or the ice formed. In the case of Samuel Jones versus New York City and NYC Board of Education, plaintiff sustained an injury after a heavy snowfall when the custodian of the school shoveled the snow into mounds that prevented safe access to the crosswalk at the curb. Samuel sustained a serious fracture of his leg which resulted in amputation. The jury found that both New York City and the custodian of the school were negligent in the manner in which the snow was shoveled and mounded and that this negligence caused the plaintiff’s injury.